It took place between Robbie Lawler and Carlos Condit and with the course of the time, it became the one what was very much expected. Both the men fought to their best in the octagon. As the consequences, both got hurt and dropped. Both of them put their 100% to win the title. However, at the end, it was Lawler who won with just an edge over Condit. He got the title barely. In the first round, Condit showcased a volume game in which he successfully dropped Lawler middle of the fight. The result for the second round was opposite. Lawler dropped Condit with a counter attack. The 3rd round saw both the men equally fight. While in the fourth one, Condit ruled and Lawler appeared to be slow. The last round was one of the best which MMA history has ever witnessed. Lawler surprisingly returned to his full form and smashed a few ton of hard strikes on Condit. However, Condit backfired. Both the men exchanged some crazy set of punches. So, both got hurt. Lawler got it in the end, though late. 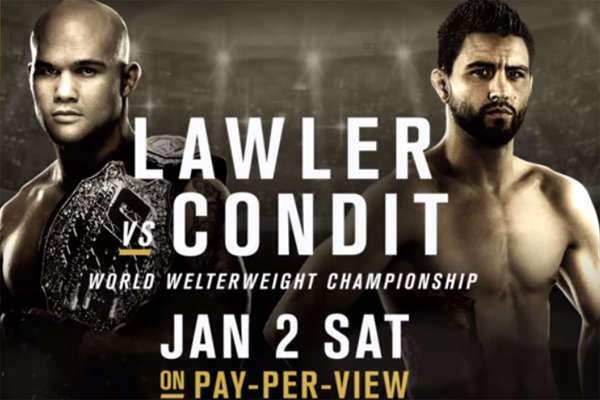 The scores read on the scoreboard / scorecard were 48-47, 47-48, and 48-47 and as a result, Robbie Lawler won and continued the title of welterweight champ.